Photolalia: State Surrealism -- Some images... and a few brief words about them. (Berkeley, 2008. Image copyright Hamish Reid; click on the image for a larger version…). Surrealism is in the mind of the beholder, I guess. Some people are going to see a rather normal American football band gathering in the photo above; others might see what I see every time I walk up through UC Berkeley's Sproul Plaza on a game day, a subtle riot of unintended surrealism. I much prefer the accidental or unintended surrealisms to the laboured and often rather grim staged or didactic versions, and this is the real thing. State-sanctioned surrealism, for that matter — all those cheery uniforms, the bright colors, the polished brass and silver instruments, the bizarre visual and physical rituals with call-and-response theatrics, the bustling clash of out-of-tune and out-of-time groups of instruments being warmed up and parts being practiced in little clumps here and there… (you can sample some of the sounds in MP3 form here, a lightly-edited and only slightly mashed-up recording of a short walk around Sproul a few weekends ago). What else do I see? 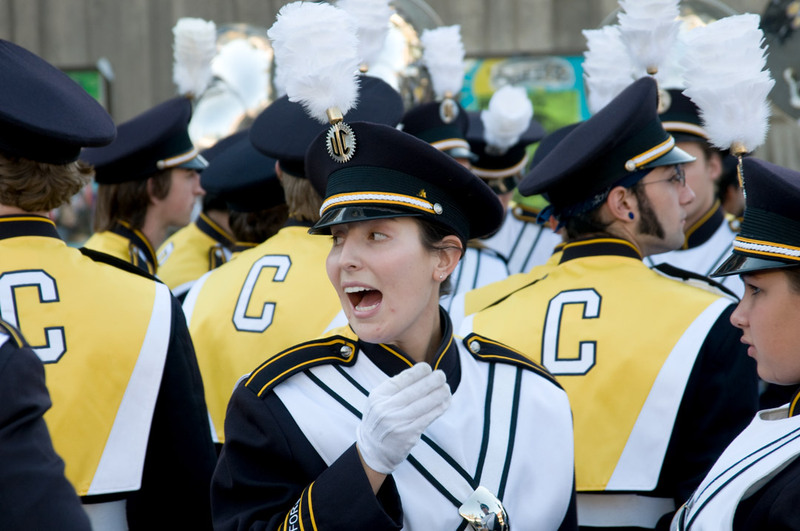 You might need to click on the image above to see it all in the large version, but here's a few: the expression on the girl in the right foreground reacting to the central figure's exuberance; the way her face is reflected in the polished brass on the central figure's uniform; the retro Lennonesque sideburns and glasses — and that blue earplug — on the guy to the center-right looking right; the guy with the long hair in the left background; and, of course, the central figure — what is she reacting to? I never saw what (or who) it was, but the delight was pretty evident. In any case, I don't do a lot of candid shots of people I don't know; most of my people shots are done in the studio or on location, and they're of people I've at least met before or know well. This is an exception, one of a whole essay's worth of still images done that day, but I'm still searching for how best to capture the whole experience….